We hear people talk about limits all the time. We talk about limiting this or that – not normally in a good way. Limiting spending. Limiting performance. Or calculus limits – and let’s not even get started with calculus. We also talk about pushing something to the limits and that’s a whole different story. Now you think about fast cars or championship sports teams. You can also think about some pretty wicked technology. So what’s this got to do with the new Rikomagic RKM MK902II? Keep reading and find out. Let’s get the important stuff out of the way first. 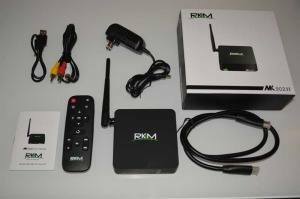 Yes, the RKM MK902II is based on the new Rockchip RK3288 CPU architecture. This is the same RK3288 which was teased back in January, 2014, and had some pretty impressive numbers even back then. At first glance, it might not seem like that big a deal. New processors come out all the time, right? Well, the key to the performance increase of the RK3288 is that it is built on a much newer architecture than the RK3188 that it replaces. The Cortex-A9 which is at the heart of the older RK3188 originally came out way back in 2009. By contrast, the ARM Cortex-A17 which powers the RK3288 is up to 60% faster than it’s predecessor in mobile benchmarks. That chip, which was released at the beginning of the year is geared towards the mid-range mobile market. This means it’s geared for both performance and power efficiency. Computing power is nice, but you’re not here to find out what will crunch those numbers on your Excel files faster, right? The other half to the of the performance puzzle lies in the new graphics GPU – the Mali T764. The T764 is a four core version of the Mali T-760 chip – thus the name 764. This version of the T760 MP4 runs at 600MHz, almost double the clock speed of the Mali 400. It even outperforms the eight-core Mali 450 in overall graphics performance. Some other hardware improvements are the inclusion of Gigabit wired Ethernet and the move from single band WiFi to dual band WiFi. The WiFi uses both 2.4GHz and 5.8GHz. One notable feature missing is the video camera. 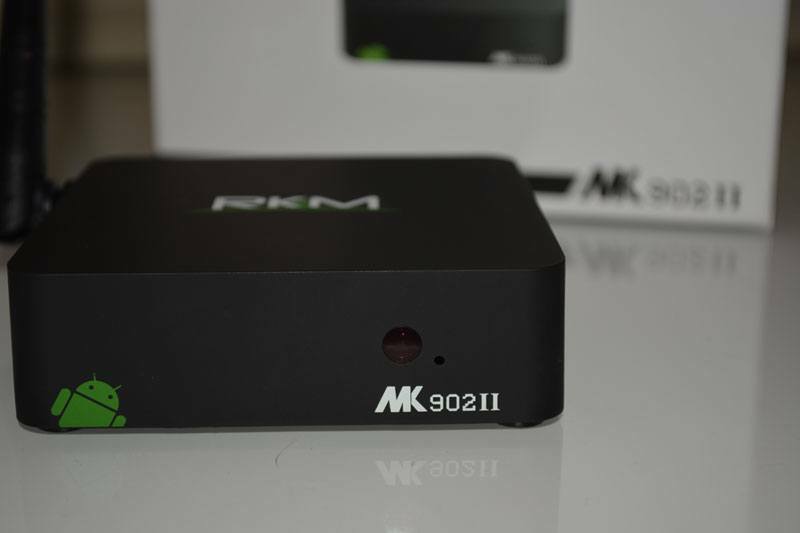 Although the original RKM MK902 came with a video camera built in, the MK902II doesn’t include one. Personally, this doesn’t bother me at all. I have my streaming devices in the entertainment center underneath my television. This gives any internal cameras a great view of people’s knees as they sit on my couch. I’m guessing that the people at Rikomagic were thinking the same thing when they decided to nix the internal camera. The RKM MK902II includes everything you’d expect an Android streaming box to include. It comes with a wireless infrared remote control, power supply, composite video cable and a male-to-male USB cable. The male-to-male USB cable might seem a bit out of place. You’ll use it when you hook the MK902II up to your PC in order to upgrade the ROM. Don’t worry, if you like the way the device works out of the box, you’ll never need to use it. It’s nice to have, just in case, though. Like most other Android mini PCs, there’s an external WiFi antenna. Unlike most other devices, though, this one is not removable – at least not easily enough to make me feel I wasn’t going to break it. The antennas on the MINIX Neo X8 or the SkyStreamX boxes had antennas that attached to brass threaded screws. The plastic base of the RKM MK902II’s antenna is permanently attached to the case. The included remote control is a basic infrared (IR) remote. It’s got the basic buttons you’d expect, including media controls at the bottom of the remote, a prominently positioned “Back” button, a four-direction D-Pad as well as Home, Mute and Menu buttons. It also includes a power button so you’ll be able to turn the RKM MK902II on and off from the remote. One catch, though. If you completely shut down the device – in other words, not simply put it to sleep, you won’t be able to turn it on with the remote. You’ll need to do that part manually. The layout is simple and intuitive, which makes the remote easy to use. It is also surprisingly capable, despite being so basic. For simple tasks like browsing for video files and pictures, it does everything you’d need. It’s not motion sensing, so gaming is out of the question. Personally, though, I find it a bit too small to comfortably use in my hands. There’s no sort of texture on the back, so it tends to slide around in my hand, making it difficult to use. And even though there’s an ergonomic groove in the back for your index finger, you’ll still need to grip it tightly to make sure you don’t drop it. Setup is easy, just as you’d expect. Normally, I like to measure how fast a device boots up before it gets to the main screen, but I wasn’t able to do that with the RKM MK902II. It actually booted up faster than my TV. As with any recent Android mini-PC, there’s only a few connections that you need to worry about. You’ve got the HMDI cable, which Rikomagic has been nice enough to include in the box. After that, plug in the power adapter and you’re ready to go. Finally, you’ll also need to decide how you want to interact with the device. Are you a couch-surfer with remote in-hand? Or are you going to be a desktop user with a wireless keyboard and mouse? Either way, you’re covered. With 4 USB 2.0 ports, you’ve got more than enough ports for whatever you want to hook into the MK902II, and you can’t go wrong with either choice. 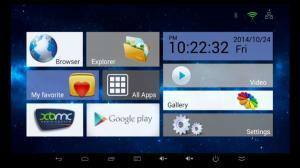 The menu systems for Android mini-PCs have come a long way since the original Rikomagic MK802. Back then, you got the basic Android home screen, and maybe a custom folder – if you’re lucky. Now, if a device doesn’t have a slick, custom interface it makes us think the designers rushed the product into production. There are a lot of similarities between the new, custom interface of the RKM MK902II and one of my other favorites, the MINIX Neo X-8’s launchpad. Both will give you large, Metro-style icons which can easily be seen from across the room. The Rikomagic dashboard, by contrast, is more cheerful. The color scheme is still based on a dark-blue starfield, but the icons themselves are more bright and cheerful. The time and settings screen are much more noticeable on the right-hand side of the screen. It’s nice that the clock is easily read at a glance, even from a distance. The focus is apparent right away. I get the impression the designers were obsessed with making sure everyone who looked at this screen could tell it was a video player first, and everything else second. Your eyes are instantly drawn to the full color XBMC logo and Google Play logos. The Browser and Gallery icons are also set to a high-contrast background to grab your attention. The way the RKM MK902II is set up, you’ll spend most of the time using those four easy-to-find icons. Another option is the “My Favorite” icon – complete with a “not-too-cute” red heart. This is essentially a customizable folder for you to add whatever apps you use most and keep them in one handy location. I decided to take a peek at what’s underneath the matte black case of the RKM MK902II. For those techies that are looking for specific part numbers – here’s what I found. If you’re not one of those people, I won’t hold it against you if you skip to the next section. I mentioned earlier that the wireless antenna is permanently attached to the case, and that become more apparent once you get access to the circuit board. The grey wire coming from the antenna leads to the AMPAK AP6330 wireless chip. 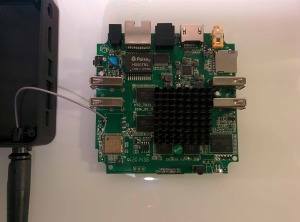 The chip has a Broadcom BCM40183 BT module and a Broadcom BCM4330 WiFi module which gives it a maximum WiFi speed of between 65Mbps or 72Mbps, depending on what source you look at. Thanks to Sarco and Tomhl at Freaktab for the research. On the lower right hand corner, opposite the AMPAK WiFi chip is the Samsung 8GB flash storage. I wasn’t able to find the exact model number in their product catalogue, but I was able to find some similar products here. 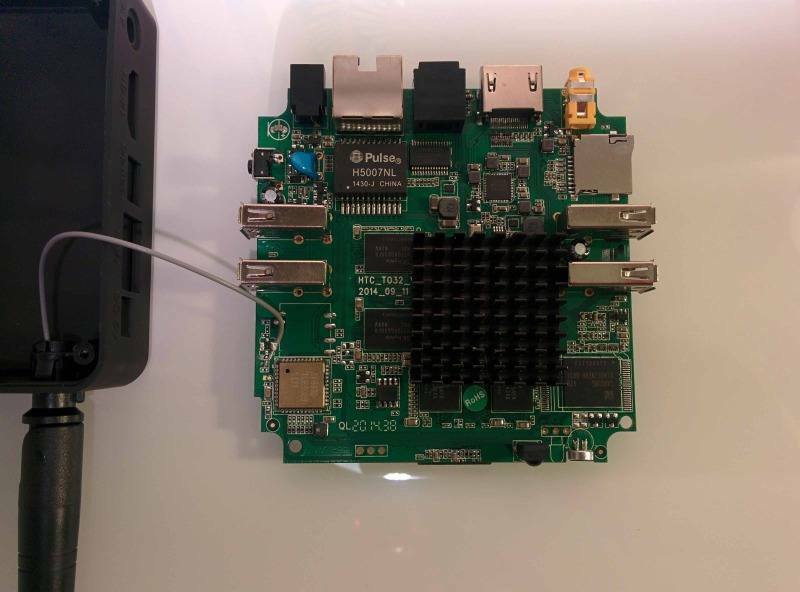 Near the top of the board is the Pulse Electronics H5007NL Gigabit Ethernet controller. Finally, underneath that and to the left of the black heatsink are the two SK hynix H5TQ4G63AFR DDR3 memory modules. They’re specifically designed for high-bandwidth applications like video streaming. Now that we’ve looked at the hardware under the hood, let’s see what it can do. In the weeks leading up to the release of the RKM MK902II, Michelle at Rikomagic sent me a number of benchmark results, each better than the last. So it goes without saying that I was really looking forward to running my own tests. 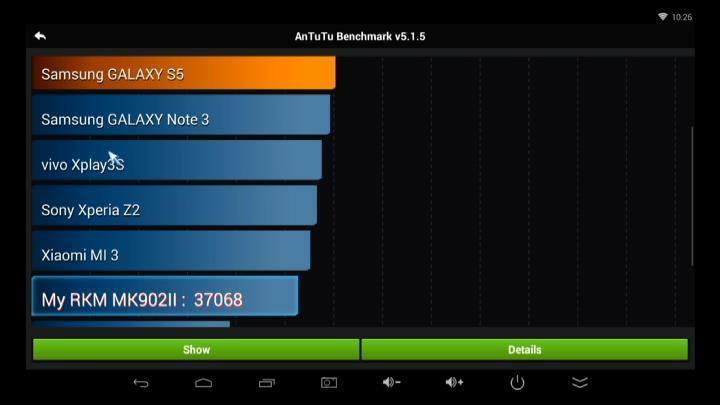 We ran our standard battery of Android tests which involved AnTuTu Benchmark v5 and 3dMark’s Ice Storm tests. The pre-launch results from Rikomagic’s own AnTuTu benchmarks were just over 40,000 – far faster than any device I’d tested before. I realized that’s probably a tweaked device that was streamlined just to see how fast it could possibly go. What I tried to do, by contrast, is to simulate what any user would see when they tried to run their own benchmark – no optimization, no tweaking. The benchmarks are the first thing I run on a device after installing all of my usual apps from the Google Play store. Even still, repeated testing consistently clocked the RKM MK902II with an AnTuTu benchmark score of over 37000. The score of 37068 is shown here to the right. This was actually a little slower than the Tronsmart Vega S89 that I tested recently, so there’s room for some improvement. It’s important to note though that the Amlogic S802 of the Vega S89 is an older chipset at a much later state in its life cycle. Ther’s not much higher performance that can be tweaked out of that chip. The RK3288 by contrast is just getting started. I’d expect them to improve on that score soon. The other major test platform is 3DMark’s Ice Storm test. I prefer this test because it speaks to my inner gamer. There’s just something about seeing the lens flare of a space battle or a high-velocity chase through an ice canyon. Here’s where the RikoMagic RKM MK902II really shined. If you’re not familiar with the Ice Storm test, here’s a bit of a primer. There are several tests wrapped up into one. There are 1080p and 720p versions of the test both of which will tax a system in slightly different ways, but both focus on the graphics processor (GPU). There’s also a physics test – sometimes known as bouncing bubbles – which will stress test the main CPU. I like to run the full battery of tests. Each device has its own quirks and strengths. First up was the Ice Storm 720p test. The video was amazingly fluid, almost too fast actually. Its like watching an old video game that you installed on a new computer. Details that you couldn’t see before are there, and everything seems crisper and more detailed. The frame rate was pegged at 60 frames per second. Pretty good. Now, tests are one thing, but real world performance is another. Since the RKM MK902II is obviously geared toward video playback, I wanted to spend a good bit of time focusing on how it played movie files. CNX-Software has a great resource for finding audio and video samples, that I highly recommend checking out. The resource is a few years old, but it was updated as recently as October 2014. There’s also a great thread on enabling an HDMI passthrough to get Dolby Digital and DTS over at Freaktab. Check it out if you want to output your audio to a home theatre receiver. My test files consisted of the 720p, 1080p and 4K versions of Sintel. The 720 and 1080p versions played flawlessly, even streaming over WiFi from my file server. The 4K version had some buffering issues and was not watchable. This may be due to the extremely large (5GB) file size, however. Playing the same video via wired Ethernet decreased the buffering issues noticeably. I also tested live video streaming from the WatchESPN and WatchDisneyXD apps – don’t laugh, Star Wars Rebels was on, and I thought it would make a great test. I think the best thing I can say is that the video quality was so good that it made me forget that I was supposed to be running a test and not watching the show. Likewise, live sports on ESPN played with no issues over WiFi, even though my router was in the next room. There was the typical issue where the video initially plays at a lower resolution, but then quickly changes to a full HD playback. All in all, the video playback was exactly what you’d expect to see from a device that is connected to your HDTV. There’s a lot to like about the Rikomagic RKM MK902II. The gaming performance is amazing, and the video playback is solid, even if there are the occasional WiFi buffering issues. There are more than enough ports to hook up whatever peripherals you need, including external storage. 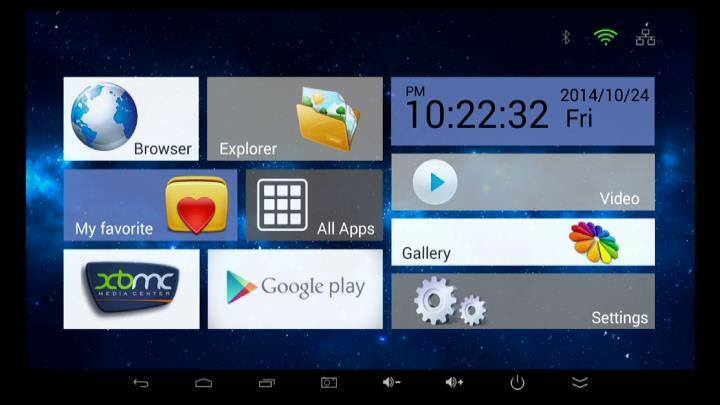 The interface was designed for the living room making it extremely easy to navigate – even for non-technical users. There are some quirks, though. The RK3288 architecture is new, so it can be buggy at times. Rikomagic has been good about releasing new firmware on a regular basis. But, stability is always a concern with new chipsets. That’s the trade off for the higher performance ceiling. In the end, I can definitely recommend the Rikomagic RKM MK902II. It’s a brand new design that has some tremendous upside potential. I can’t wait to see where they take it from here. Could you load Limelight on a bunch of boxes and see which streams games the best? Do you know if the RK3288 chip also supports 4k YouTube Video playback ?